KHAI: Well, for starters there's the shorts - what I'm planning to do is try and edit them together with some fillers in between to give a bit of a low down on each one. And it's not just the short films - there'll also be one of the episodes I wrote and directed for the TV series 'Dark City', the music video for my band Rollin' Sixers' last single 'Hard Love', the trailer for EMP's upcoming theater production 'Bars and Bedrooms' of which I'm one of the directors and I'll also be announcing the latest thing I'm currently working on which I can't really talk about right now but I'll tell you this - that's the thing I'm really excited about, finally being able to let the cat out of the bag on that one. Next week will also be the first time 'Ciplak' will be available on DVD and it's gonna be packed with extras - audio commentary, deleted scenes, music vids, the works - which is totally funded by WAMM. We'll also be doing a Q&A where I'll answer anything I possibly can - about the flicks that are showing, about The Thing That Will Be Announced, about the weird and wacky world of this industry, about the non-filmmaking stuff, whether I prefer boxers or briefs or having my junk swing in my jeans, anything. And since a lot of times local audiences in general are a bit reticent about asking questions in a public forum I'm gonna make it easier for all y'all - if you're too shy to ask me directly or if you can't make it or if you're just more comfortable using the internet to communicate, you can hit me up with your questions on twitter with the hashtag #askkhai and we'll look 'em up during the Q&A and answer them. So yeah - it'll be a fun time and I'm totally looking forward to it. Super Ring, Chickadees, Twisties and Mamee, Discounted Burgers from THE BEE and free drinks to go along with the awesome CIPLAK. What more can one ask for? I know, MORE! If you enjoyed (or missed) this screening, be sure to come for the 5th May Screening at THE ACTORS STUDIO, Lot 10 next week. We'll be selling a limited edition and first ever DVD printing of CIPLAK. There'll be an announcement for Khairil M.Bahar's next flick shooting in June 2011. Click here for the older post about this. 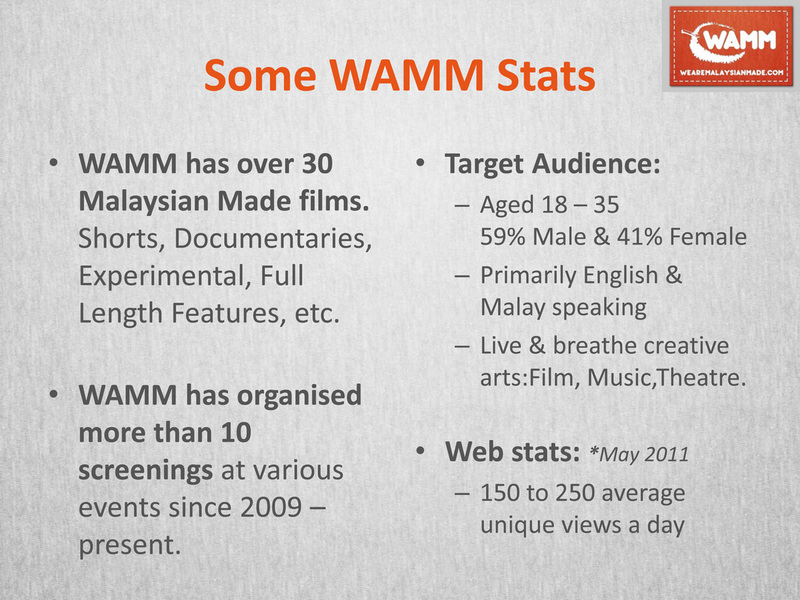 WeAreMalaysianMade.com screening stuff you never get to see on local TV or the Cinema. WAMM presents a never put together before; KhairilM.Bahar showcase! Visit the FB EVENT PAGE : 27th April now for more details. 27 April 2011 | 8.30pm | RM 10 minimum donation per entry at THE BEE. > First 30 at the Door: Free PopCorn! 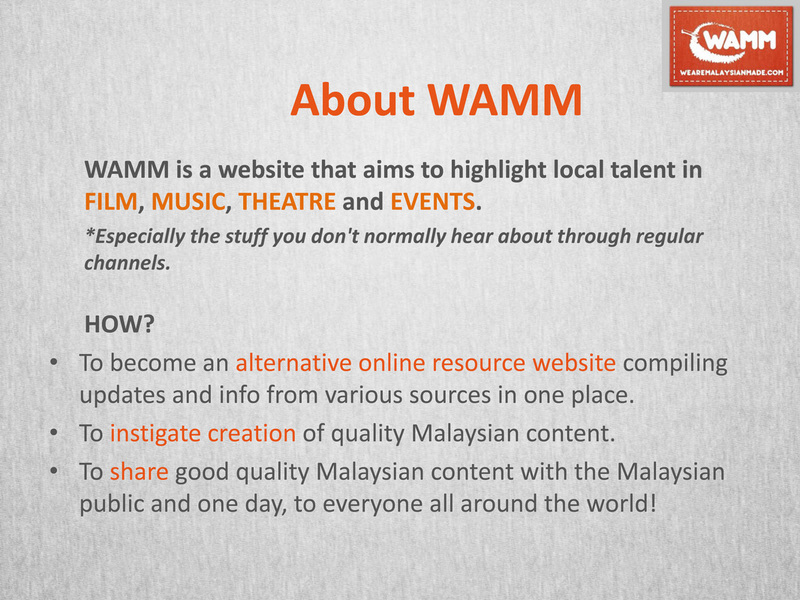 *Email wamm@wearemalaysianmade.com with subject header: "I Nak Datang!" with an image of RM 10 transfer to special WAMM fund Maybank 1647 2605 0427. 'Ciplak’ was Khairil’s first attempt at a feature length film and was shot on a shoestring budget of only RM10,000 (RM8,500 of which was spent on the camera. The film was released by Aflam Sdn Bhd and distributed by Golden Screen Cinemas in the GSC International Screens in Kuala Lumpur and Penang. The film was very well received with a majority of positive reviews across the board. Ciplak’ won the Anugerah Skrin 2006 for ‘Best Alternative Film’.The screening will end with an up close and personal Q&A session with the man himself. Visit the FB EVENT page now and put down your attendance! 5 May 2011 | 8.30pm | RM 10 minimum donation per entry at The Actors Studio, Lot 10 Rooftop. A video compilation & commentary of rare and almost impossible to get Khairil M.Bahar works. And another first : selling his award winning debut movie "Ciplak" on DVD! | *Printing of DVD's totally fronted by the WAMM fund! Close up & personal Q&A with the man himself. Only available through WAMM screenings and a must see! 180 over people in attendance. Rollin' Sixers opening the night with an acoustic performance. STOP MOTION PROJECT videos, Sharifah Amani's SANGKAR and Nadiah Hamzah's HUJAN PANAS both starring the awesome Beto Kusyairy. It was a magical night. More than WAMM could ever hope for. And we aim to do more. We at WAMM would like to take this oppotunity to humbly thank Beto for helping with the hook up to Nadiah and Sharifah Amani. Of course, big thank you to Nadiah and Sharifah for agreeing to be part of the screening. SMP, thanks. You ladies are the best! Khai & the Rollin' Sixers, you guys rawk! Pictures above courtesy of WAMM Contributor: Anrie Too.